Covillea Bukit Jalil: With its prime locale and easy accessibility, Covillea represents an excellent investment or a primary home for both locals and expatriates. Set in 400 acres of resort development is Covillea Bukit Jalil, a winning development in Bukit Jalil by Berjaya Golf Resort Bhd. Specially designed for growing families, the freehold condominium homes are built to suit today’s modern lifestyle needs. Despite the prime address, the residential properties here do not come with a high price. Covillea spans a total of 2.91 acres and is sited adjacent to the Bukit Jalil golf course. It comprises two 20-storey highrise blocks with a total of 308 units and a five-storey car park podium. All units have a panoramic view of the international standard 18-hole golf course with certain units having the added view of the swimming pool. 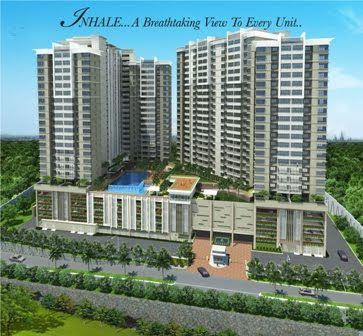 Covillea comes with condominium facilities and multiple security checkpoints. Even the infinity pool and the glass gym overlook the golf course. The two monorail stations, namely the Bukit Jalil station and the Sri Petaling (Star LRT) station are located within walking distance. And this development is easily accessible via major roads and highways. With the elevated Mex Expressway, the Kuala Lumpur International Airport is just a 20-minute drive away. Basically, Covillea units come with three bedrooms plus a utility room. There are two layout designs with a spacious built-up of 120 sq m (1,293 sq ft) and 131sq m (1,415sq ft). Each unit is provided with two covered, car parking bays. For those who enjoy gardening, there are some units on the ground floor that come with extra land to create your own private garden. The units on the lower floor have a unique balcony with an eye-level view of the golf course or pool deck. And the full-height windows on the higher floors allow you to enjoy plenty of natural light and ventilation. During the launch on Nov 21, the first 30 buyers of Covillea units were offered a rebate of RM10,000. Apart from the legal fees absorbed by the developer, Berjaya is also offering 0% interest* payment during construction - until Dec 31. Repayment starts only upon completion. 1 Petaling is designed with a modern and practical concept. 1 Petaling serves to be a rewarding investment for first-time homebuyers and young couples. This newly launched mixed-development project spans 1.66 acres of land and is close to established neighbourhoods like Sri Petaling, Bandar Tasik Selatan and Seri Kembangan. The project offers stylish condominium residences and dynamic retail environment to the thriving community of Sg Besi. Housed in a 20-storey block comprising 250 units of condominium units, located on the fifth to the 20th floor, residential units comprise spacious “three-bedroom and two-bath room” units and “3 plus 1-bedroom and three-bathroom” units designed with a modern and practical concept. The units come in five sizes from the smallest unit of 82sq m (884 sq ft) priced from RM180,935 to the 109sq m (1,171sq ft) units with 3+1 bedrooms priced from RM280,888. Several units even come with a courtyard garden, giving the feel of landed property living. Complete with lush landscaping, 1 Petaling offers comprehensive facilities such as a swimming pool, wading pool, gymnasium overlooking a pool, reflexology path and a children’s playground. The development has been designed with a multi-tier security system with a video and CCTV network. Enhanced security features include card access to the lift lobby and car park as well as centralised SMATV which offer residents peace of mind. In addition, there are interest-free instalment plans* for the initial 10% on the downpayment. The Hazel 2 terraced houses at Berjaya Park in Shah Alam, will delight first-time homeowners with its attractive features and minimal need for renovation. With only 87 units left, Hazel 2 offers freehold exclusivity on a development site that spans 7.53 acres. The spacious built-up area ranges from 216sq m (2,320sq ft) to 254sq m (2,737sq ft), certainly a generous allocation for a terraced home. The homes offer four bedrooms with attached bathrooms and a spacious car porch, easily accommodating two parallel parked cars, making this landed property perfect for young executives, first-time homeowners and upgraders. Construction of the project has already begun, even before the launch. Thus, buyers may enjoy vacant possession of their homes earlier than expected. To further benefit new homeowners, Berjaya and the bankers have agreed on a special arrangement whereby after the house key is handed over, the purchasers can enjoy 12 months of no-payment. The above respective promotion will end in December 2009. Terms and conditions apply. Jalan 1C/149, Off Jalan Sg Besi, KL. SKN Land & Development Sdn Bhd, a developer of high-end properties, plans to develop two property projects with a combined gross development value (GDV) of about RM450 million in Kuala Lumpur. Chairman Mohd Rosly Hussein said one of the projects is a mixed development on a 1.2ha site in Desa Pandan and another is a residential development at Jalan Yap Kwan Seng. The GDV for the Desa Pandan project is about RM350 million, while the other project has a RM100 million GDV. 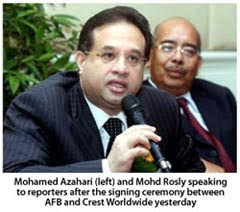 "We have already submitted our plans to the Kuala Lumpur City Hall and are waiting for approvals," he told a news conference after the signing of partnership agreement between Asian Finance Bank Bhd and Crest Worldwide Resources Sdn Bhd (CRW) in KL yesterday. CRW, a member company of SKN Land, is currently developing Crest Jalan Sultan Ismail - a mixed development comprising a 44-storey luxury residence tower and a 26-storey Grade A office tower with a GDV of RM500 million. Mohd Rosly said the Desa Pandan project will be developed on a vacant land, while the company will demolish the existing building which houses the company's office at Yap Kwan Seng to make way for the residential project there. SKN Land currently has a 2.8ha landbank in the city centre. Asian Finance Bank Bhd (AFB) expects to attract investors from Asia, Australia and the Middle East for its RM500 million mixed development project called Crest Jalan Sultan Ismail in Kuala Lumpur. Chief executive officer Datuk Mohamed Azahari Kamil expects to announce the results of roadshows held in Qatar, South Korea and Indonesia next month. The roadshows will be extended to Singapore, Australia and the Philippines, while AFB's associate in London, European Finance House, will help market the property. "A lot of investors are looking at Malaysia for long-term investments in commercial and residential properties. Demand is tremendous, especially for properties in the Golden Triangle area," he told reporters after the signing of a partnership agreement between AFB and Crest Worldwide Resources Sdn Bhd (CWR) in KL yesterday. CRW, a member company of SKN Land and Development Sdn Bhd, has appointed AFB as the global marketing representative promoting Crest Jalan Sultan Ismail, as well as the end financier for the project. The project, which is expected to be completed in 2011, features a 44-storey residential tower and a 26-storey office block spanning 0.28ha. Out of the 288 Crest residential units, only 92 units are left for sale, while SKN Land plans to sell the Crest office tower en-bloc. Mohamed Azahari said a few sovereign wealth funds are currently in talks with AFB's majority shareholder, Qatar Islamic Bank, to invest in the Crest office tower. He added that AFB plans to grow its property loan portfolio, which is currently small. About two-thirds of the bank's loan portfolio is in trade financing. After three years operating in Malaysia, AFB's funded assets have grown to RM1 billion, of which property comprises about one-fifth. PETALING JAYA: YNH Property Bhd is seeking legal recourse against Kuwait Finance House (M) Bhd (KFH) for backing out of a commitment to buy a 45-storey office tower worth RM920mil. YNH told Bursa Malaysia yesterday it had been notified by KFH in writing that the latter would “no longer be proceeding with the formalisation of the sale and purchase (S&P) agreement as per the terms and conditions of the offer letter dated Jan 11, 2008” for the en bloc purchase of Menara YNH, located along Jalan Sultan Ismail, Kuala Lumpur. “As such, the board will consult our legal advisors on all of the options available to our group, including but not limited to specific performance and/or seeking damages from KFH,” YNH said. A YNH spokesman told StarBiz the deal “went sour” because KFH wanted to purchase the property at a lower price than initially agreed. “It was all an issue of pricing. The property market has softened by about 20% since we entered into the agreement nearly two years ago. KFH wanted to buy at a lower price while we wanted to maintain the original value,” he said. The spokesman said YNH was seeking legal advice from its lawyers and was confident of a positive outcome. “An option is to sell the property to the highest bidder and claim the difference from KFH. The agreement is legally binding,” he said. He also said KFH’s decision to pull out of the deal would not have a negative impact on YNH. He said preliminary earthworks had commenced at the project site and actual construction was expected to begin in a few months. YNH head of corporate services Daniel Chan was quoted in a news report in August that the deal with KFH “is basically firmed up” although the S&P agreement had yet to be signed. “As far as we are concerned, the signing of documents is just a formality,” he said. An analyst from a local bank-backed brokerage said that while the property market had softened, it should not have an impact on YNH. “The economy is already on the upturn and property prices will also be on the uptrend. The yields in the area are also good and the company can always find other buyers,” he said. KFH offered to purchase a 50% interest in YNH Land Sdn Bhd’s proposed 45-storey office tower in early 2008. YNH Land is a unit of Kar Sin Bhd, which in turn is a wholly-owned subsidiary of YNH Property. In a previous note to Bursa, YNH said the office tower was located in the Golden Triangle area where “most prestigious five-star hotels and upmarket office spaces” were located, with easy accessibility and close proximity to efficient public transport facilities like the Putra light rail transport and KL monorail stations. The Malaysian unit of Kuwait Finance House has pulled out of a RM920 million (US$270 million) deal to buy part of an office tower from a local property developer. Malaysia’s YNH Property Bhd told the stock exchange late on Tuesday that Kuwait Finance House Malaysia (KFHM) had informed it that it would not proceed with the purchase. YNH Property also said it may seek legal demages from the Islamic bank. No reasons were given for the pullout. A KFHM spokesperson said a statement will be issued later in the day. Valued at about 1.8 billion ringgit, the YNH tower was to be constructed in the Malaysian capital. YNH Property signed the deal with KFHB last year in January. Malaysian rating agency RAM Ratings last month revised its outlook on the firm to negative from stable, citing a challenging operating environment in Kuwait that has pressured the credit fundamentals of its parent. Kuwait Finance House has said that it is not exposed to the debt problems of Dubai state-ownd conglomerate Dubai World or its property unit Nakheel, which have undermined investor confidence and thrown a spotlight on weak commercial real estate markets worldwide. Mah Sing Group Bhd is making an en bloc sale of a seven-storey retail office space known as Apex Tower in Sungai Besi, to one Chen Ho-Yean for RM63.09 million. KUALA LUMPUR: KPJ HEALTHCARE BHD, a hospital management group linked to the listed AL-AQAR KPJ REIT on Wednesday, Dec 16 announced plans to acquire a plot of freehold land in Muar, Johor for RM22 million in cash. On the rationale of the deal, the company said: "The proposed acquisition is in line with KPJ group's objective to increase its network of hospitals to locations where private healthcare is in demand." The company announced in a stock exchange filing yesterday that its unit Maharani Specialist Hospital Sdn Bhd has entered into a Sale and Purchase Agreement (SPA) with Property Base Development Sdn Bhd for the proposed acquisition of land on which stands the partially completed seven-storey Maharani Specialist Hospital Building. The building, whose construction was abandoned since 2005, is expected to have a gross floor development area of 260,000 sq ft. In the announcement, KPJ said it intends to commence construction works on the hospital building, immediately upon completion of the SPA. Further development work is expected to cost about RM26 million to be financed by internally generated funds, with completion by end-2011. The building is expected to be used as a private hospital. The acquisition is to be free of encumbrances and KPJ expects to complete the land acquisition by first quarter of 2010. The deal is not subject to KPJ shareholders' approval but regulatory and government approvals are required, the company said. Ministry of Health approval is necessary for the completed property to be operated as a private healthcare facility.